THIS HALL BE NOT BE AVAILABLE FOR POSTGRADUATE STUDENTS FOR THE 2019/20 ACADEMIC YEAR. 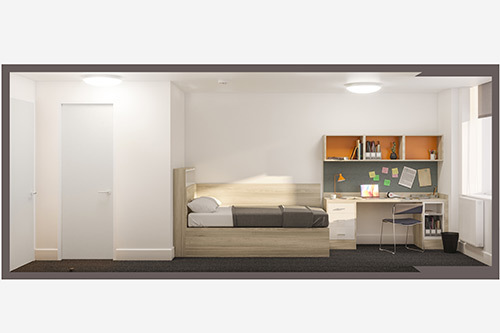 This hall of residence is offered to City, University of London undergraduate students in conjunction with Liberty Living, a third party housing provider. Students who are offered accommodation at Liberty House will sign an agreement with Liberty Living and not with City, University of London. Please note you will not be able to move into this property before the 14th September 2019, if you require accommodation before the contract start date you will need to book a hotel or a hostel. Approximately 2 minutes walk from City, University of London. Both single and double beds are available (preferences will have to be made at application stage but they are not guaranteed). Liberty House Sebastian Street has five floors. There is access by lift up to all floors (including the basement area), there also stairs to all floors including the basement areas. Please note: We are currently witnessing a rise in residential developments and associated building works in the local area. We anticipate that there will be some noise pollution over the year and urge any prospective residents to take note of this. Liberty House Sebastian Street is situated on Sebastian Street in the area of Islington and Clerkenwell - an ideal location for students studying both at the main City campus (Northampton Square) and at Cass Business School. Living in Liberty House Sebastian Street means you're within easy walking distance of all City's teaching facilities and close to many trendy restaurants, cafes and bars. You're also close to the Barbican Centre, one of London's liveliest cultural venues. The Barbican offers galleries, a theatre, cinema screens and concert halls. Nearest Underground station: Angel, Barbican, Farringdon, Old Street. Maps on where the halls are relative to City, University of London can be found here. Rent is paid in 4 instalments for students with a UK guarantor or full payment of £9,450.00 will be required by 31st August 2019 if you do not have a guarantor. If any student does not have a UK based guarantor then full payment will be required on the 1st instalment date. If you are being sponsored and can provide written evidence of the dates upon which you receive your sponsorship then a bespoke payment plan is a possibility. Yes, you do need a UK based guarantor. Yes you can. For bank details, please contact Liberty House. Yes, we offer payment plans to students to coincide with their loan receipts, but this must be organised and agreed (sign payment plan) with Liberty Living and we must be notified as soon as possible. Once you have agreed the terms and conditions of the contract you have 14 days to change your mind and cancel the booking, you must email us at londonsales@libertyliving.co.uk as soon as possible so that we are able to process your request. If you cancel before the end of the 14 days you will be released from contract and receive £100 of your deposit payment back. If you need to cancel after the 14 days are over, you will need to find another City Undergraduate Student to act as a replacement tenant. You would be liable for the room until there is a suitable replacement to take over the contract. You need to contact the Student Centre at City University as soon as you know when you’re leaving. They will do their best to find another undergraduate student at the university to take over your room. You can also find someone yourself, but any new resident needs to be a City undergraduate. Deposit refunds are processed within one month of the moving out date or the contract end date, whichever is the later. If you leave early and your room is taken, then your refund will be processed within one month of your leaving date. Yes you can one guest three nights a week, any longer than this will need to be discussed with staff beforehand. Only if the room is available and ready. For further information on arriving before the contract start date, get in touch with the site team on 0203 725 3500. Please note there will be extra fee for the additional nights. May be possible depending on when new academic year contracts start. The cost of laundry is £2.30 per wash and £1.50 per dry (prices may change).